San Diego Comic-Con is wrapping up as we publish this, a weekend jam-packed with hype and reveals across movies, TV, comic books and of course video games. 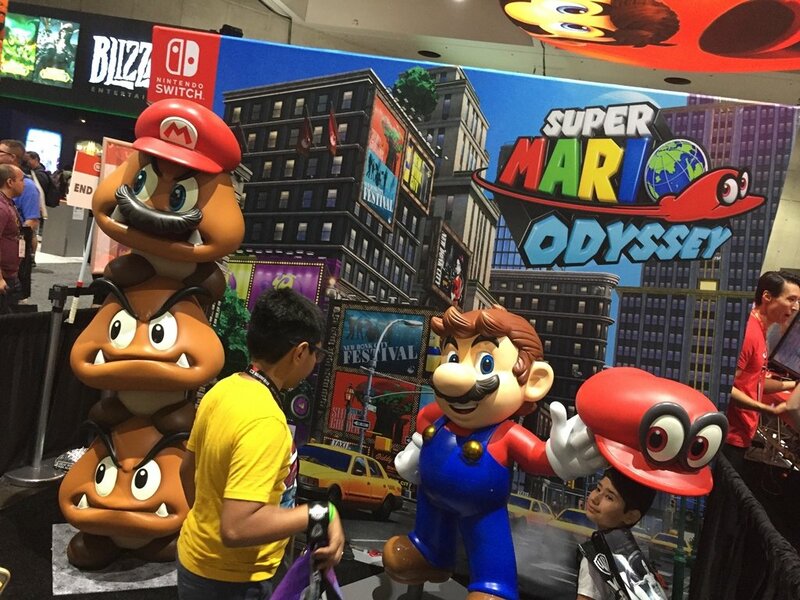 Nintendo had a booth inside the main expo to showcase Super Mario Odyssey, and also welcomed gamers (with or without expo tickets) at a separate event nearby to try out a whole lot of Switch and 3DS games. Our man Alan Lopez has been enjoying a weekend of fun and festivities in the city, and as it all wraps up brought together some pictures from the show. 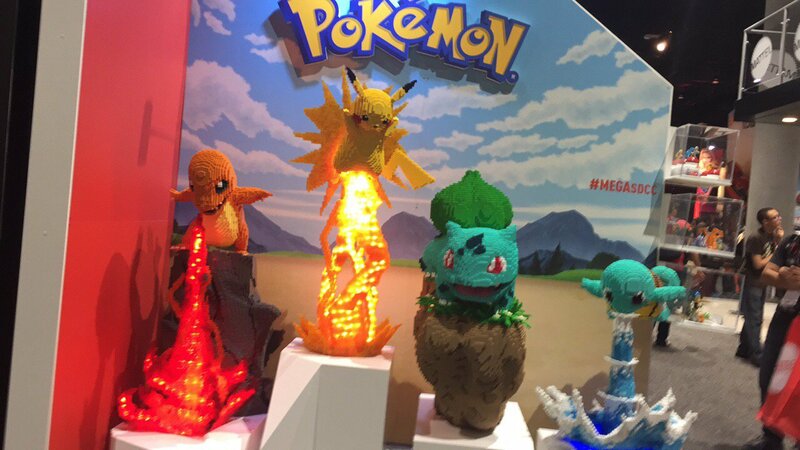 We see how part of the E3 booth was re-created, and a number of fans showing off some awesome cosplay. I wish I was there sooooo bad. I really need to calculate how much it will cost to go there and save up. Not bad at all those attempts at costumes. Don't know who that is in the second last photo, not in a costume, I'm guessing Alan Lopez. I can't be the only one thinking that Pikachu is having a particularly violent bowel movement. 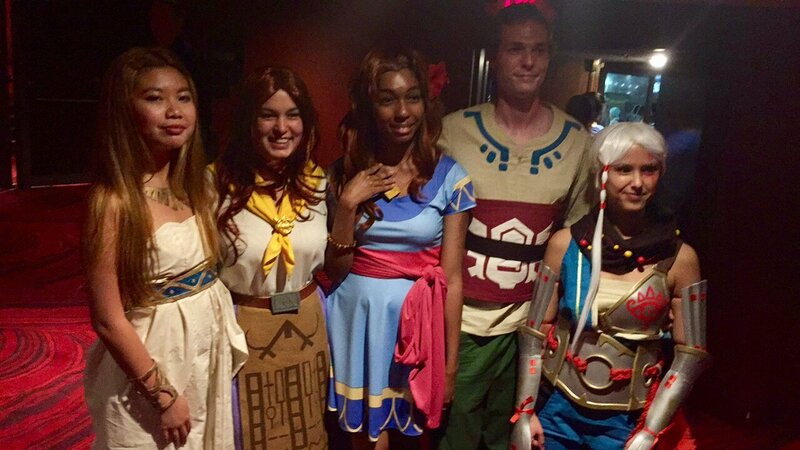 I'm a big fan of these fans...the hard work and dedication (+ creativity) they put into these costumes is simply inspiring. 1. 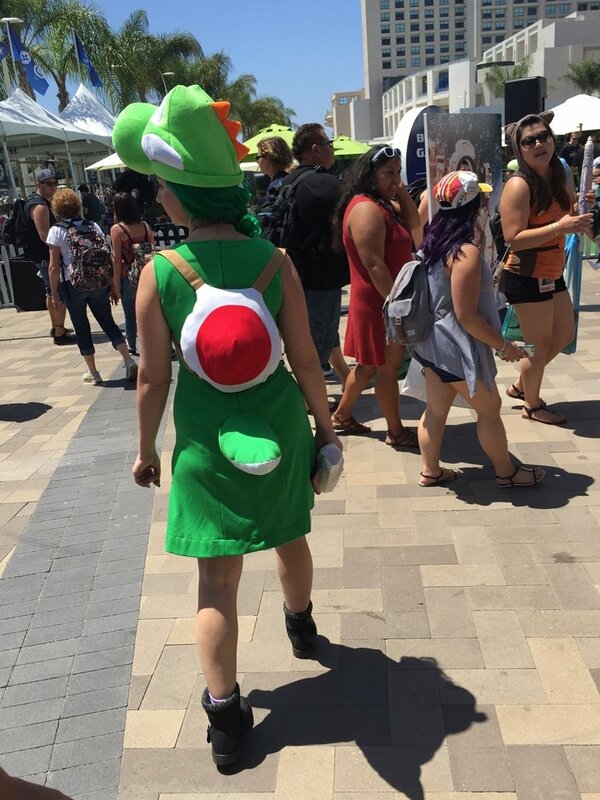 That Yoshi dress is so cute! 2. If that is Alex in the photo, my question is...is that a blue tortoise shell in your pocket, or are you just really happy to be at Comic-Con? Looks like fun. It looks like Alan(?) is saying "I forgot my costume! What do I do now? " Pictures are of me. If they were of Alex, you'd be able to see his British accent. That Guardian dress looks really nice. A lot of time, care, and creativity seems to go into those costumes! @Pandaman Possibly dumb question. Who are you? @shaneoh came here to say it looks like Pikachu's crapping a thunderbolt. Found out I'm not the only one who thinks so. 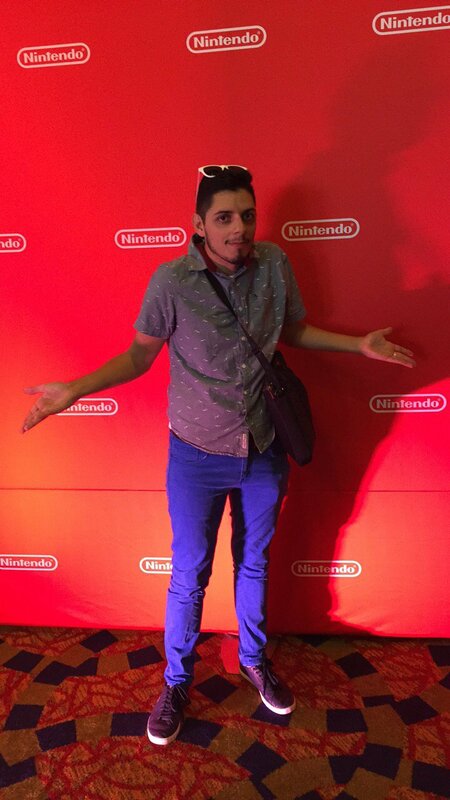 No pics of the official Splatoon 2 cosplayers Nintendo hired?? Also, love that Guardian cosplay, that's clever. @PurinPuff Judging from the hastag, partnerships, and the display case on the side there, I'd say sadly it's the inferior MegaBlocks brand. 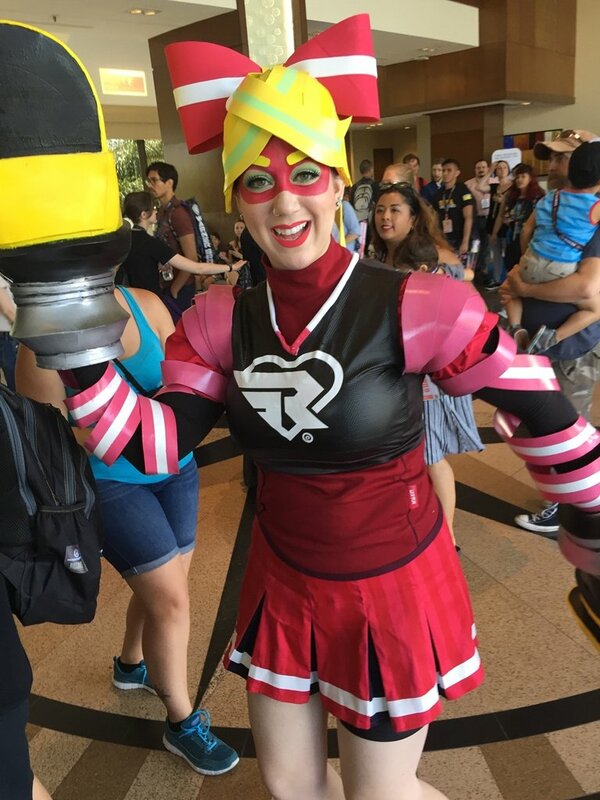 I saw a Ribbon Girl cosplayer. My guess is Waluigi for the 2nd to last pic. 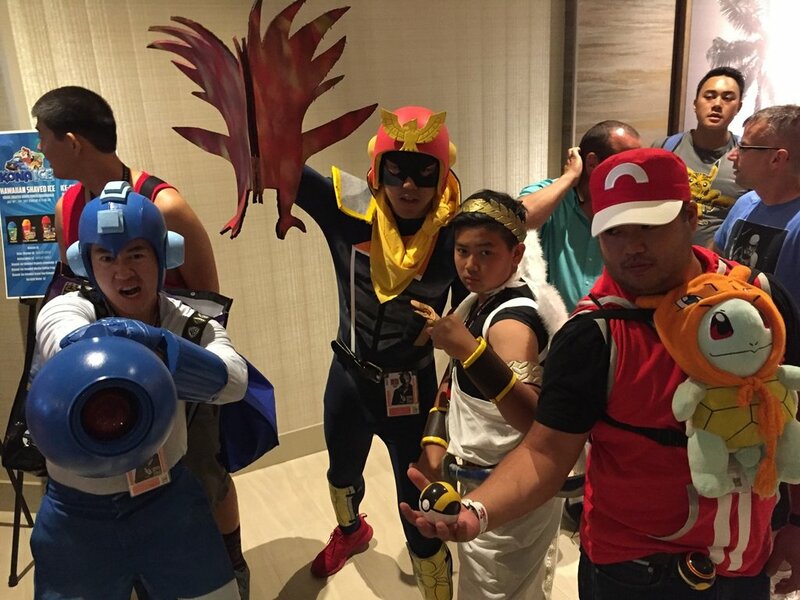 I've never seen before a Captain Falcon Cosplayer with a Falcon Punch. I like the Guardian costume. 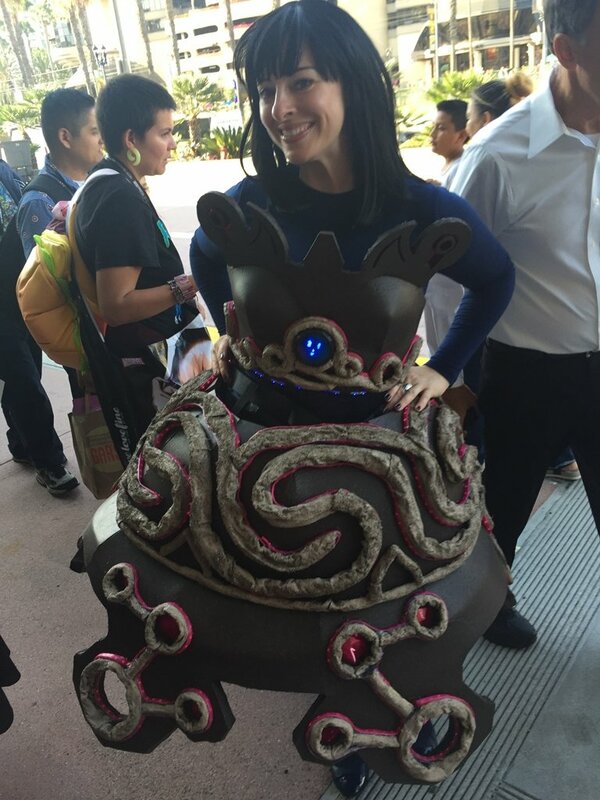 I made the Guardian dress, thanks so much for the picture!